Many people do not realize how frequently rear-end accidents occur or even worse, how serious the injuries can be. According to an Insurance Institute for Highway Safety (IIHS) recent report, rear-end collisions are the third leading cause of fatalities in car crashes and caused nine percent of all deaths—919 deaths—in 2014. Even if you are in a low-speed rear-ender, you could suffer long-term injuries like traumatic brain injury, neck and back injuries, fractures, or spinal cord injuries. This is why you need to hold the negligent driver accountable for his actions and for compensating you for your injuries. Why Do Negligent Drivers Cause Rear-end Accidents? Tailgating. A driver is definitely disobeying the rule to keep a safe distance from the car ahead when he is purposely tailgating another vehicle. This is a dangerous form of aggressive driving. Speeding. When a driver is speeding, he simply does not have the time to slow down quickly or stop when the driver ahead of him stops suddenly, with a serious rear-end collision and possible multi-vehicle crash being the result. Distracted driving. If a driver’s mind and eyes are off the road when he is eating and drinking, texting, talking on a cellphone, or grooming, he cannot possibly see the sudden movements of the vehicle in front of him with sufficient time to respond. Drunk driving. When a driver is intoxicated, his reaction time and general driving skills are impaired. In addition, he could be drowsy or fall asleep at the wheel. Any of these conditions can lead him to cause a rear-end wreck. Drowsy driving. Too many people drive when they are tired. If the fatigue is severe enough, it could be as dangerous for the person to drive as if he was drunk. Weather conditions. Motorists who fail to drive safely in weather conditions like ice, heavy rain, and fog, can easily slide into the vehicle in front of them if they lose control of their vehicles. 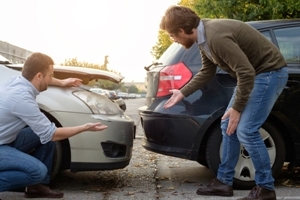 Were you injured in a rear-end accidents caused by another driver? While it may be easy to prove the liability of the negligent driver, his insurance company could still try to pay you less than you deserve. Let the Hart Law Firm negotiate your settlement to ensure that you are not taken advantage of. Start an online chat today to schedule a free case evaluation with our experienced car crash attorneys.